The role of financial analysts is to audit or inspect the economy. Along with this, they also assist the industries and companies to decide in investment decisions for banks, corporations, investment firms and insurance companies. They are said to be the title for many chore responsibilities which can be budgeting, accounting, or cost analysis. The main aspect required to attend a financial analyst interview is to present your skills in analyzing the economic conditions and understanding the basic financial analysis. 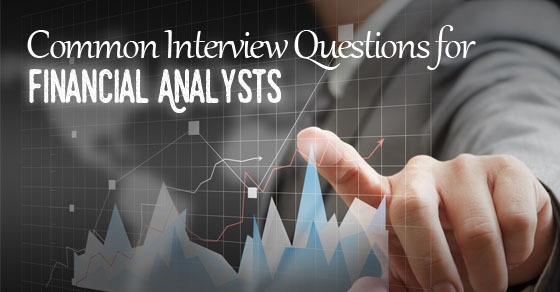 The following mentioned are few finance interview questions that can help one becoming a financial analyst. The usual practice in conducting a financial analysis is called financial modeling. It can also be mentioned as a quantitative analysis which is mainly utilized for asset pricing or for general corporate finance. The important aspect of financial modeling is that hypothetical variables are utilized in the formula so that the impact on economic conditions, profitability, and market behavior can be determined. It is always advisable to present your answers with an example. You can mention that financial modeling can be used to find out the jet fuel cost for airlines for the annual rise of 5% in crude oil for future years. 2. What are the programs that you will use in order to prepare illustrated technical graphs, charts or spreadsheets? For answering this accounting interview question you must not mention the specific program but mention the usage of one program over the other. You can also mention that you would are willing and have the capability to use any program that the organization opts. You can mention that Microsoft excel is the one you prefer as it provides more of statistical and analytical references. In the same manner, to have an enhanced view of graphs or charts which assist in illustration of points, you can mention reports ultimate. Irrespective of whatever you have used, mention that you have utilized multiple software programs in preparation of reports. Also never forget to mention that you have the ability to capture and become proficient in whatever program the organization follows for the preparation of reports. 3. Mention the single best evaluation metric for analyzing company stock? There is no specific answer to this analyst interview question and hence, it is mandatory to mention a reasonable point of evaluation and explain the context for using the metrics. When you estimate a company, mention the first point as the operating margin profit as the metric. Mention that you opt for this metric because it shows the management of the company overall apart from the basic profitability. The price earnings to growth ratio can also be mentioned as a single most complete equity valuation metric. You can give a reason that it considers projected earnings growth rate and also higher ranked commonly used price/ earnings ratio (P/E). Make sure to pick any evaluation metric that you prefer is the best. The main trick in answering this question is explaining the strength of the particular metric that you mention. 4. Explain quarterly forecasting, expense models and updating revenue? The product or the service and its respect and demand in the market are mentioned as revenues. At times when it is mentioned that revenues would boom, it means that profits will enhance and also the expenses would elevate when compared with incomes. 5. What challenges are you expecting in this financial analyst position? The right way to move forward with this question is to mention the ways you would utilize your financial analyst skills and experiences in the job role that you would be hired for. You can mention that you are a person who is boosted by challenges and also possesses the capacity to face any challenges in the career. You can also make a point that you have the skills and knowledge to handle any challenge in the job. Remember to mention the goals as well as challenges you met prior. 6. What is the difference between journal entry and a ledger? The book which has the original entry is called a journal. The book is mandatory one as it has all the transactions that associate to the company for the specific financial year. The journal can also be mentioned as the mother of the ledger. In this scenario, all the accounts are portioned as debit and credit as per rules. The ledger is one which has particular accounts which is taken from the original journal. 7. Why should we hire you for financial analyst position? For this finance related interview question, the candidate should formulate the answer by associating his skills, education, personality, and experience along with the job role. To answer this question the candidate must understand the job description and also the culture of the company. You can also show that you’re a good team player by linking them with examples. When you do not possess much of skills, experience or qualification, it is important to show your energy and passion. Employers look out for charismatic people who have complete energy and confidence in their speech. And hence, it is mandatory to present yourself as a confident, motivated and energetic individual. This is a very important finance question for interview and the candidate needs to prepare for the same. The candidate should make sure to visit the company website, run through the about us page and careers page. To get to know more about the company the candidate should go through the LinkedIn page of the company. To know the latest updates and news about the company, google search as press releases along with the company name. It is not necessary to mention everything you learned, but mention the services and products the company sells. Give a data about the period through which the company has been running the business. Mention the mission statement of the company, the culture of the company, and how the values associate with your personality. 9. What is the difference between p&l account and income and expenditure statement? Business concerns who desire to earn profits by functioning business are ones who use profit and loss account. In the same manner, trusts, non-profit organizations make use of income and expenditure statement. It is the trading organizations that prepare P&L account in order to find out the net profit or loss of the organization’s operation. Non-trading organizations prepare income and expenditure account, to find out if they have made a profit to run their business further or is in a loss. 10. What kind of salary do you expect? This are some tricky interview questions for analyst and you would really lose it if you answer it straight away. Remember not to answer the question where you can frame your answer in a way where you can mention that it’s a tough question or ask the employer to tell you the range for the position. You can just answer that it depends on the financial analyst responsibilities and job roles. 11. What is variance analysis and mention about the time that you used variance analysis to conclude? The evaluation of performance by means of variance is mentioned as variance analysis. Its timely reporting is one which enhances the opportunity for remedial action. You can mention your previous example about variance analysis and the way you used it. In order to answer this question make sure to identify the issue, discourse about variance analysis, its reason and impact and also a projected corrective measure. 12. Do you have any questions to ask us? This question usually comes up at the end of the interview and important to be focused. Avoid asking questions related to perks, leave, place of posting, salary and more. Instead, you can ask them about any development or induction programs that take place in the organization. Otherwise, you can also ask for a feedback and mention that you would evaluate and enhance strength and other shortcomings. 13. What makes good financial analysts these days? A good financial analyst is one who is able to bring out the best from a huge amount of data. A good financial analyst is one who has the capability to transfer the data into a right financial decision about what is to be bought and what is to be sold. 14. Why did you choose our company? When such question is put forward, make sure to emphasize more on the good reputation of the company. Mention that the environment of the company is challenging and you are ready to face challenges. You can also mention that you can work together with the company and help the organization grow. 15. From your point of view, what are the characteristic that makes a good financial analyst? To answer this question it solely depends on one’s philosophy. The main characteristic in order to become a good financial analyst is that he should possess the capability to take the right financial decision at the appropriate time before other pop up with a decision. By asking this question the employer would test your ambition and ability to develop yourself and also plan for your future as a financial analyst. When you have not decided on the goals then mention that you’re busy with the organization and its duties and hence focus on long-term goals. If you have short term goals or career oriented goals then you can mention them that what you desire to become in the next 2 or 5 years. 17. What are your biggest strengths? This is one main question which helps the employer polish your qualification appropriate to the job role. Mention your knowledge, experience, skill and ability appropriate to the job role. Pen down a list of strong points, which are a perfect match with the job role. Run through the job requirement again and make your strengths related. Mention your strengths in your resume as well as cover letter. You can mention that you have been working for so many years with excellent skills and abilities but have not been promoted at the right time. You can also mention that you are ready to face challenges but your previous job isn’t challenging. Other reasons can be that your company paid you late, or you may have traveling issues and more. Remember not to talk ill about your previous company, or if you had not achieved your task or if you were punished. Let the answer be a genuine one which can be accepted by the employer. 19. If you are selected when would you like to join? When such a question is put forward, make sure to leave the choice to the employer. Ask them their convenient timing to join and be ready for the same. In case, you have any formalities to be completed with the previous employer you can mention the same, but do not drag up in joining the job. So mention the employer that you would join anytime they mention. These are a few common interview questions for financial analyst that would be asked for financial analyst’s position. Graduates, who are trying to get recruited for this position, should remember that they should pass the interview with qualifying marks. These accounts interview questions and answers mentioned are useful and can help them get the job role quickly. All these tips are beneficial for graduates to enhance their knowledge and get placed in the best organization. Apart from deep technical questions, the graduates should also have a smart idea to answer common questions initially to get through the interview. Run through the above-mentioned points and get benefited. Next articleWhy Interviews are Important in Recruitment Process?